The KonMari method was created to help you to live in the present. By holding onto items that you love and discarding what doesn’t bring you joy, you clear away the clutter that interferes with your mindfulness. Once you’ve completed the initial discarding process, you’ll need to arrange what’s left in an easily-accessible way. Your home renovation project can help you to organize and maintain your wardrobe and thus your state of mind. After the initial discard process, KonMari requires you to organize your clothing into tops, trousers, dresses, and coats. The wardrobe calibration strategy for hanging space creates a triangular shape, with your shortest items on the left and your longest ones on the right. Each category is then separated into colours so that you can find what you need at a glance. Your rushed pre-work mornings will become far less chaotic, and so will your mind. The strategy allows for a degree of personalization. If colour categories make your wardrobe more difficult to use, you needn’t hold onto them. The trick is to create a storage system that’s usable to you, so most KonMari converts have their own unique approach. It’s time to move onto your shelving and drawers. Folding and rolling your clothes into a burrito shape saves space and keeps everything accessible. With this method, you can search without mess normally created by digging to the bottom of neatly folded piles. 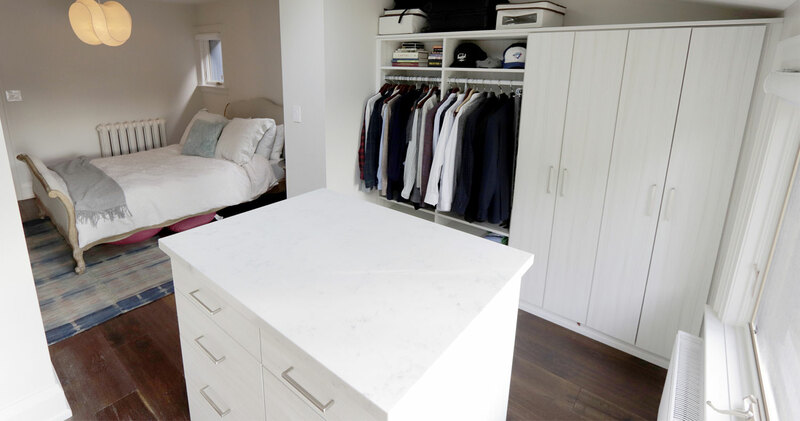 You need a drawer or shelf for every clothing category, and this is where your home renovation comes in. A KonMari closet needs enough bins and shelves for every category, from underwear to trousers and tops. 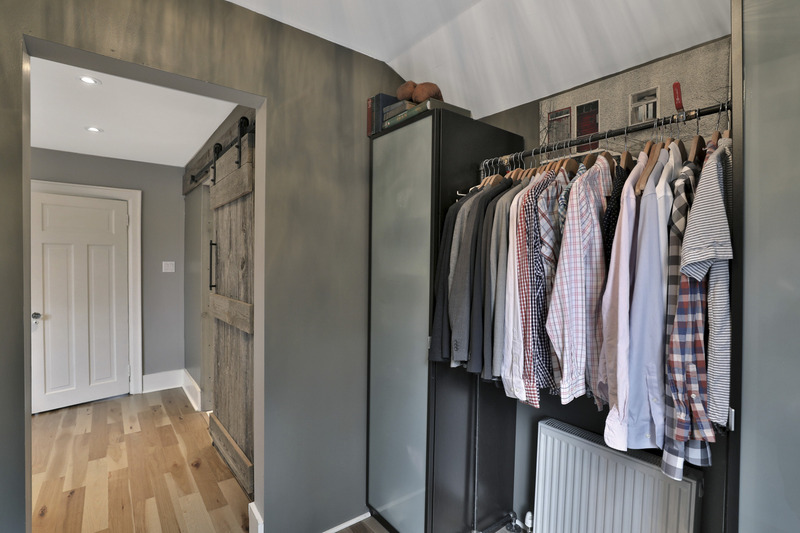 A walk-in closet is, of course, the most luxurious and user-friendly way to achieve that. Walk-in closets offer enough room for wall-to-wall shelving, bins, and several rails. It may be worth considering turning that discarded study into a new wardrobe to bring ease to your mornings. Instead of installing a traditional closet, plan for the shortest shelves necessary for each clothing category. The shorter shelves leave room for wicker baskets and drawers to further organize your KonMari sorted piles. Your shoes only need a few inches, and the shorter height you save will create an extra shelf. You’ll need plenty of width for your purses, but adding a hanging rod to the wall will ensure you’re using the full depth of your closet. Economy requires a little splurging, but simply hanging your rail higher will leave enough room for extra shelves underneath. Placing two bars on top of one another creates double the room for your tops and coats while simultaneously forcing longer items onto their own rail. Your doors represent an entirely new opportunity: turn them into a storage rack by adding rails for high heeled shoes. If you can afford deep closets, you could also use brackets instead of rails. This shallow hanging space will let you keep your KonMari categories on their own bar. Sweaters are your bulkiest items, and they should never be hung. Save space by rolling and stacking them vertically. Your piles are liable to become cluttered quickly, so they require short, narrow shelves. Consider splitting the traditional shelving size into quarters. Make the KonMari method your own, and it will take you far further. Organize according to the way you use the space. It is your closet, after all, and it should make you as happy as those Jimmy Choos do.